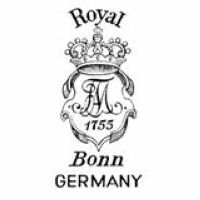 During 1829 the lay magistrate of Bonn tried to sell the Rosenkranz property again, but to no avail. The son-in-laws of Rosenkranz, Christian von Reth (also named van de Rett) and Vianden decide to pay the creditors and take over the factory themselves in October 1829. The factory was renamed to Christian von Reth & Co. and continued business until 1836, having a workforce of only 24 people. By now, the technological lead by Wessel could not be made up for. At the time Wessel had a mill and a steam engine, the Christian von Reth & Co. still powered their factory through two horses in chains walking around in a circular building, thus turning the middle shaft which was used in combination with different gears. Unable to achieve rentability since the takeover, the factory had to be sold to the main creditor, the lawyer von Recklinghausen, a resident of Köln. The lawyer von Recklinghausen then took over the factory with his brother-in-laws Paul Joseph Mehlem and Everhard Joseph Mehlem. 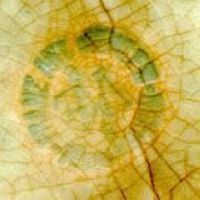 At the same time von Recklinghausen ordered the facility director Reinecker to carry out experiments with different mixtures for stoneware and faience. As shown in an official business report to the mayor of Bonn, the company had only a workforce of 18 people left before December 26th 1838. As there was no possibility for expansion and the factory itself was too old to be refitted for further use, the Mehlem brothers sold the whole factory to Franz Joseph Wessel (who had taken over the ⇒Porzellan- und Steingutfabrik Ludwig Wessel from his father) and transferred their business to the newly built premises between the river Rhine and the 'Coblenzer Straße' just on the heigth of the 'Zweite Fährgasse' during the first week of 1840. 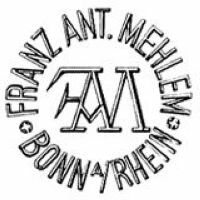 The new factory already used two coal-fired kilns instead of the old wood-burning type in the previous facility and the company was renamed after the father of the two Mehlem brothers, Franz Anton Mehlem. The Mehlem company stood in direct competition with the famous company of Villeroy & Boch in Mettlach and the Mehlem brothers tried to persuade the local government to grant them a special contract for cheaper coal from the state-owned coal mines in the Saar area during 1840, but to no avail. 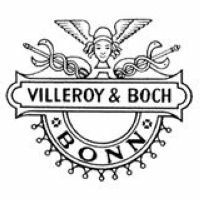 It should be noted here that the factory of Villeroy & Boch was located near the Saar coal mines and did not have to pay for transport, generally making their products cheaper to produce. First expansion steps included a third and fourth kiln during July 1841, followed by a steam engine in July 1845. On January 19th 1848, the company applied for permission to build two additional kilns and a chimney, which was granted shortly afterwards. 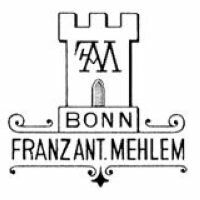 On March 1st 1853, the Mehlem brothers applied for permission to build a house for themselves on the grounds of the factory, the so-called 'Chateau du Rhin'. Permission was granted and everything looked alright, but the company already had to mourn the loss of von Recklinghausen and Franz Anton Mehlem when Paul Joseph Mehlem died shortly afterwards. On January 10th 1854, Everhard Joseph Mehlem applied for permission to build a seventh kiln, which was also granted. At this time, the company already had 40 potter's wheels. It was the last expansion before Everhard Joseph Mehlem died in 1865, leaving the assets in the hands of a community of heirs with the name of Braubach & Kaeser. 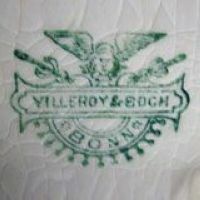 As stated in notes from Eugen Boch, the company of Villeroy & Boch approached one of the heirs, Mr. W. Kaeser during 1865, trying to take over the factory, but the businessman Ferdinand Frings from the city of Uerdingen had contacted the heirs earlier and was able to take over the facility. Frings, who had traveled around a lot, saw the possibility of opening new markets for products from the Mehlem factory and started to make minor changes in the product range, clearly targeting the French, British and U.S. markets. The chimneys on the factory premises had always been quite tall, allowing the wind to thin out the thick black smoke and during September 1867 an additional chimney was installed, but problems with the neighbours continued. Finally, the neighbors complained to the mayor in a four paged document that reached the town hall on April 19th 1869. Because the industry was by now a vital source of both taxes and employment the mayor decided not to intervene. Ferdinand Frings was always traveling around and in 1873 employed Max Roesler (who later founded the ⇒Porzellan- und Feinsteingutfabrik Max Roesler in Rodach) as technical manager. When Roesler quit not quite a year later, Frings decided to find a partner who would keep an eye on the business. In 1874 he was joined by Franz Guilleaume, a young businessman from Köln who was born on September 19th 1848 - he was just 25 years old when Frings died during a visit in Britain. Guilleaume was the son of the businessman Theodor and Henriette Guilleaume (born Büttgen) and had learnt his trade based on the knowledge of his father and a lot of personal visits to Britain and the U.S. and, like Frings, saw a chance in exporting to these countries. The period around 1875 saw a lot of changes and expansions. It should be noted here that over the years many manufacturers had been experimenting with different mixtures to give their earthenware products a more porcelain-like look and feel. The companies of Porzellan- und Steingutfabrik Ludwig Wessel and Franz Anton Mehlem were leading in that technology and extremely successful during 1880 and 1910. Expansion continued and on April 24th 1882, Guilleaume applied for permission to build a further kiln, bringing the total up to eight and during November 1884 the factory name was changed to Steingut-Fabrik und Kunsttöpferei Franz Ant. Mehlem, Inhaber F. Guilleaume. Through 1885, a few new buildings are added and a lot of old technology was replaced as the factory received new pump stations and transmissions as well as modern machinery. In 1886, Guilleaume and his family moved into the 'Chateau du Rhin' which had actually been empty since the death of Everhard Joseph Mehlem in 1865. The year 1887 saw the installation of new mills and shortly afterwards a new steam engine replaced the old machinery used to knead the clay. The product range of the business was changing drastically. The company now produced household, decorative, technical and sanitary items and also produced porcelain clock cases for the American Ansonia Clock Company during the latter part of the 19th century. 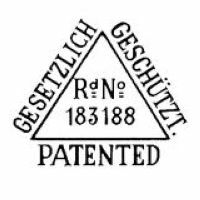 Between 1887 and 1903 the company also produced Höchst figurines from the original molds from the defunct Höchst factory. Even further expansion was planned and on August 17th 1888, another two kilns and a chimney were installed. 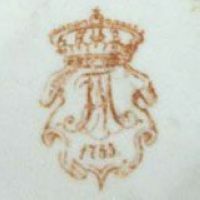 The word 'Royal' and the year '1755' was added to the company mark in 1890 and used until the company was sold to Villeroy & Boch. These additions were used in commemoration of the fact that the Kurfürstliche Fayencerie zu Poppelsdorf (see above) had been founded that year. The claim from the Mehlem business on being a direct successor in the history of the Kurfürstliche Fayencerie zu Poppelsdorf led to many hot discussions through time, but Guilleaume insisted in using this claim for marketing purposes. That this did not result in legal action through the Wessel company was based on the fact that Nicolaus Joseph Wessel, who in the meantime owned the Wessel Company together with his brother Carl Ludwig, had already issued an official leaflet on July 30th 1880, clearly informing customers and 'all that it may concern' about the status and facts regarding the original factory. Not only in the eyes of the Wessel brothers, the claim made Guilleaume and his company absolutely ridiculous. On June 15th 1892 the modernisation of the 'Chateau du Rhin' interior started. The expansion and modernisation of the facility was also in full progress. A permission dated July 7th 1892 allows Guilleaume and his architect Gustav Boudriot to completely rebuild the decoration studios and further parts of the factory along the corner of 'Coblenzer Strasse' right down to the 'Zweite Fährgasse' road, resulting in a very representative exterior appearance. This is followed by a complete rebuild and expansion through an additional level of the factory side to the Rhine river which was part of the application from October 1st 1895, also including a crane for raw materials and goods. On August 31st 1897, Kaiser Wilhelm II made Franz Guilleaume counselor of the chamber of commerce and on July 1st 1899, Guilleaume had his 25 year employment/ownership anniversary. Finally, the 'Chateau du Rhin' received a total overhaul on the outside during the year 1900. During this time the business also received an own railway connection. By now the factory itself had a very good reputation and first decorator signed pieces can be found from around 1900 onwards. Quite a lot of Mehlem products were made on special order or were made based on designs from famous artists or teachers at art and craft academies. To name a few there was Ernst Aufseeser, Wilhelm Neuhäuser or even Peter Behrens (who ordered the whole furnishings for his home on the 'Mathildenhöhe' in Darmstadt) or the famous August Macke who worked directly in the decorating studios for a short time. 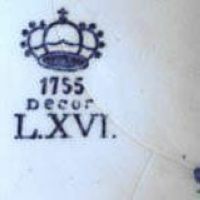 An extra note should be made on the Delftware produced by Mehlem, especially the larger plates (chargers). The quality reproductions of Delftware where so good that even Delft workers respectfully referred to the pieces as 'German Delft'. On January 3rd 1914 Franz Guilleaume died, leaving the complete company in the hands of his son, Walter Guilleaume. But Walter, as well as Franz Guilleaume's son-in-law Doctor Goertz had other plans. They needed money to open up a new business with the name of Schleifscheibenfabrik W. & A. Guilleaume, which was named after Walter and and his brother Alexander and was specialized on producing different types of grinding tools and sanding papers. 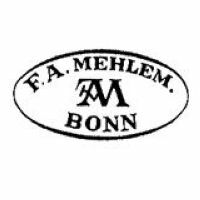 So the whole Mehlem factory was sold to ⇒Villeroy & Boch on June 1st 1920. 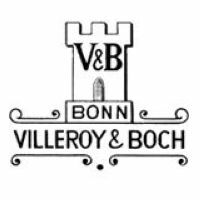 Under the lead of Villeroy & Boch the factory slowly adapted to the new market situation. As cheap mass produced goods were swamping the market, Luitwin von Boch decided in 1925 to switch production to sanitary products. First modernisations started during January 1926 and the empty 'Chateau du Rhin' was used to house the modelling rooms. The architect Peter Müller was responsible for the modernisation and had a larger steam engine installed which allowed the whole factory to utilize electricity (three-phase current only). All wooden floors had to be replaced by reinforced concrete floors to be able to cope with the much larger weight of the molds and machinery. 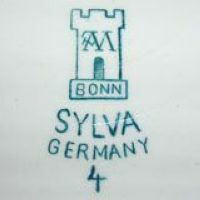 But the depression era took its toll and Villeroy & Boch decided to close the factory at the beginning of the year 1931 because it had become unprofitable. The demolishing company of Christian Krutwig in Köln was employed to demolish the main buildings, starting in December 1933 and by November 1934 all central buildings except the chimneys had already been torn down. Starting in March 1936, the chimney stacks as well as the remaining factory parts facing the Rhine promenade were demolished by the Heinrich Dorn & Jakob Büttenbach company from Bonn-Endenich. The flattened area was used by the army until 1937 when the 'Chateau du Rhin' was finally demolished, followed by the remaining buildings at the corner of 'Konlenzer Strasse' and 'Zweite Fährgasse'. By the end of 1938, the factory of Franz Anton Mehlem was no more. The monogram and tower type marks offer a basic help when identifying the intended use of an item; from 1890 onwards, the monogram mark was used on decorational items while the tower mark was used on utilarian items. 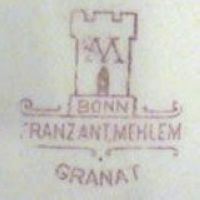 In both cases the 'GERMANY' addition to a mark of course indicates an item intended for export; however there is no explanation for the use of the 'FRANZ ANT. MEHLEM' addition underneath some tower marks. This addition seems to have been used randomly as items otherwise completely identical show either version of the mark, a few items even show both. Also note that Mehlem used a few different marks that are badly documented. 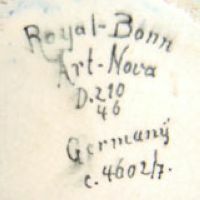 For example he used two completely handwritten 'ROYAL BONN' marks, one with 'ART-NOVA' and the other with 'ARS NOVA' as series name - both are legit 'ARS NOVA' series items as can be seen in various catalogs. 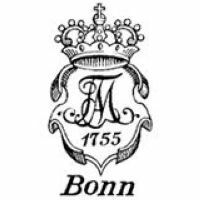 The Mehlem company also used an impressed mold name 'BONNA' for a complete kitchen series but did not use it very long as the ⇒Wessel's Wandplattenfabrik Bonn had registered 'BONNA' as trademark for wall tiles. Used around 1860, impressed stylized 'F-A-M'. Used around 1860, stylized 'F-A-M' surrounded by 'F.A. MEHLEM' and 'BONN'. Used from around 1870 until 1920, 'FRANZ ANT. 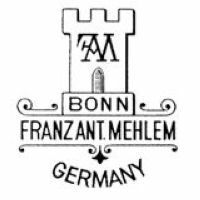 MEHLEM' and 'BONN A/ RHEIN' (Bonn upon River Rhine) in a ring around the stylized initials 'F-A-M'. Used from around 1870 until 1920, impressed version. Used from around 1870 until 1920, stamped version. 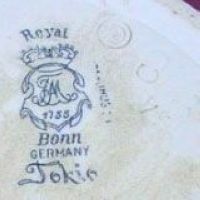 Used roughly between 1875 and 1890, crowned shield with stylized 'F-A-M' and '1755', here without 'BONN'. 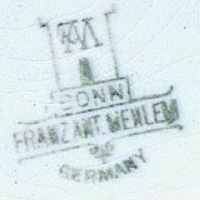 Used roughly between 1875 and 1890, crowned shield with stylized 'F-A-M' and '1755', either used with or without 'BONN'. 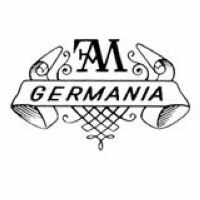 Used around 1890 and very hard to find, stylized 'F-A-M' over 'GERMANIA'. 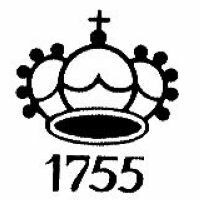 Used between 1890 and 1920, simple crown over '1755'. Only found on 'LOUIS XVI' and 'LYONAIS' items. Used between 1890 and 1920, here with the 'DECOR LXVI' (Louis XVI) addition. Used between 1890 and 1920, the well known 'ROYAL BONN', here shown over "DELFT." on Delftware by Mehlem. 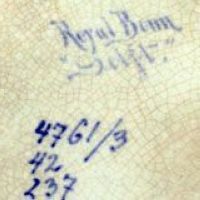 Another marking that was simply written onto the item, 'ROYAL BONN' over 'ART-NOVA' and the item number 'D.210/46'. 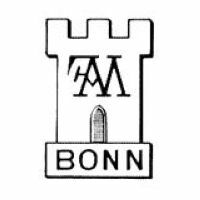 Used between 1885 and 1920, basic 'tower mark' with 'F-A-M' over 'BONN'. 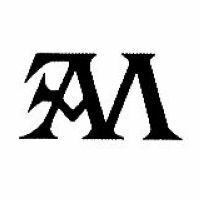 Used between 1885 and 1920, basic 'tower mark' with 'F-A-M'. Used between 1885 and 1920, here a rare version also showing the series, 'SYLVA'. 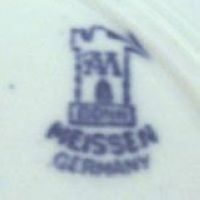 Used between 1885 and 1920, basic 'tower mark', 'F-A-M' over 'BONN' over 'MEISSEN' over 'GERMANY'. Note the impressed mark on the left. 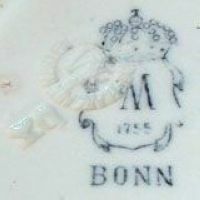 Used between 1885 and 1920, closeup of the mark shown before: 'F-A-M' over 'BONN' over 'MEISSEN' over 'GERMANY'. 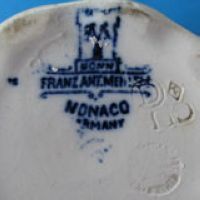 Used between 1885 and 1920, tower mark 'F-A-M' over 'BONN' over 'MONACO' over 'GERMANY'. 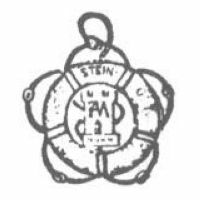 Used between 1885 and 1920, rare 'tower mark' with 'F-A-M' over 'BONN' located in a life belt (preserver). Used between 1885 and 1920, stylized 'F-A-M' in a tower over 'BONN' over 'FRANZ ANT. MEHLEM' without any addition. 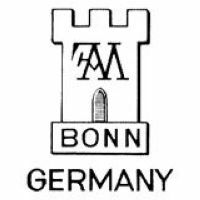 Used between 1885 and 1920, stylized 'F-A-M' in a tower over 'BONN' over 'FRANZ ANT. MEHLEM' with the normally used 'GERMANY'. Used between 1885 and 1920, stylized 'F-A-M' in a tower over 'BONN' over 'FRANZ ANT. MEHLEM'. Note the castle top is not printed correctly. 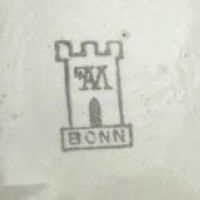 Used between 1885 and 1920, stylized 'F-A-M' in a tower over 'BONN' over 'FRANZ ANT. MEHLEM', here with the shape name 'GRANAT'. 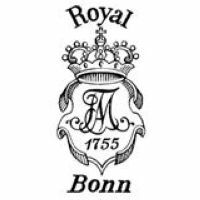 Used between 1890 and 1920, 'ROYAL' over a crowned shield with stylized 'F-A-M' and the '1755', over 'BONN'. 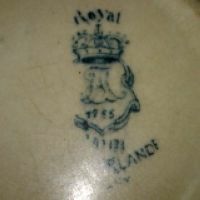 Used between 1890 and 1920, example of the previous mark on an item with 'ROSENGUIRLANDE' decoration. Used between 1890 and 1920, 'ROYAL' over a crowned shield with stylized 'F-A-M' and the '1755', over 'BONN' over 'GERMANY'. Used between 1890 and 1920, 'ROYAL' over a crowned shield with stylized 'F-A-M' and the '1755', over 'BONN' over 'GERMANY', here in red. 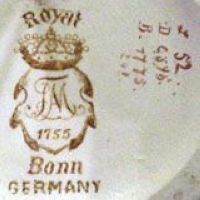 Used between 1890 and 1920, 'ROYAL' over a crowned shield with stylized 'F-A-M' and the '1755', over 'BONN' over 'GERMANY', here in brown. 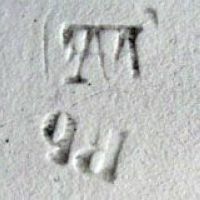 Used from around 1892, a Mehlem mark with British registration number. Normally used between 1890 and 1920, here the plain version used around 1905 (on a item from the 'TOKIO' series). 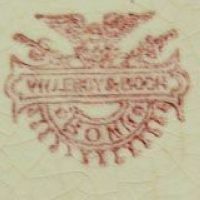 Used between 1875 and 1920, with the impressed mark. 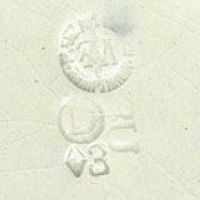 Note the plain (modern) 'F-A-M' that was used after 1910. 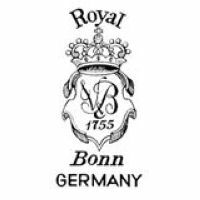 Used between 1920 and 1925, first adapted Mehlem mark: 'ROYAL' over a stylized 'V&B' over 'BONN' and 'GERMANY'. 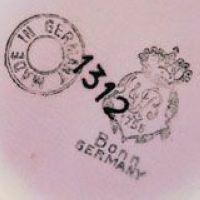 Used between 1920 and 1925, an example with additional 'MADE IN GERMANY'. 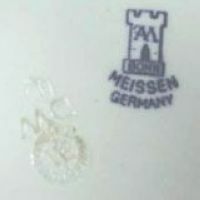 Used between 1920 and 1925, second adapted Mehlem mark: 'V&B' in the tower over 'BONN' over 'VILLEROY & BOCH'. 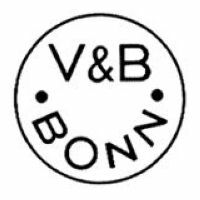 Used between 1920 and 1925, 'V&B' in the tower over 'BONN' over 'VILLEROY & BOCH'. 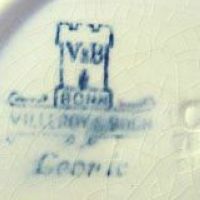 Used between 1920 and 1925, 'V&B' in the tower over 'BONN' over 'VILLEROY & BOCH', here with series name 'LEORIC'. 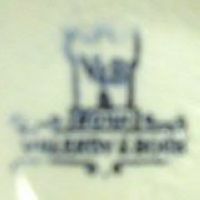 Used between 1920 and 1925. 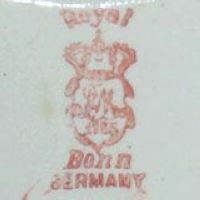 Used between 1920 and 1925, the 'Villeroy & Boch' Hermes mark (version 2) often confused with the first, used between 1874 and 1909.